Handling is dynamic yet precise, with rear axle steering significantly enhancing both agility and stability. Meanwhile, road-holding and response are second to none, thanks to fully adjustable AMG Traction Control. Lightweight construction. Aerodynamic design. And pure, unadulterated power. 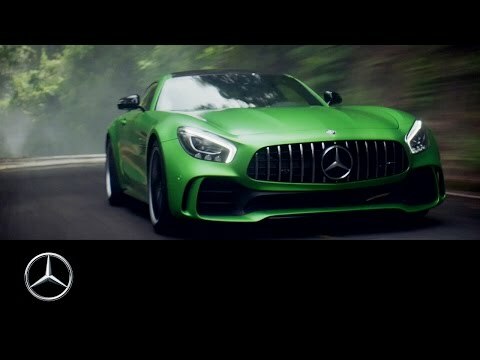 The Mercedes-AMG GT R combines these three elements to extraordinary effect. At its heart is a muscular 4-litre twin-turbo V8 engine that produces up to 585 hp and a hefty 700 Nm of torque. As a result, the GT R can sprint from 0 to 62 mph in only 3.6 seconds and has a top speed of 198 mph. Performance is further enhanced by the Active Aerodynamics system on the car’s underbody, which deploys at speeds over 50 mph to reduce resistance and maximise downforce. And the Active Air Control System within the front apron, which closes for optimised airflow and opens for improved engine and brake cooling. The interior of the Mercedes-AMG GT R reflects its race-bred capabilities. AMG sports buckets seats feature integrated head restraints and form-fitting support: essential when you’re driving a car this agile and dynamic. The AMG performance steering wheel features gearshift paddles and fingertip controls for that race car feel. And the AMG DRIVE UNIT lets you adjust traction levels, select pre-set driving modes, and more. As you’d expect of a sports car honed on the Nürburgring, the Mercedes-AMG GT R is supremely deft, agile and assured. The model features AMG rear axle steering, which enhances agility by turning the rear wheels alongside the front wheels. At higher speeds, this also helps to improve stability and response. 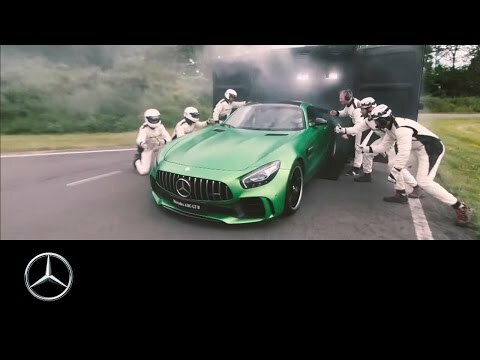 Any car as quick and powerful as the Mercedes-AMG GT R requires serious braking force to keep it in check. So, the AMG high-performance composite braking system comes as standard, giving you complete confidence and control even in challenging conditions.  For added peace of mind, Brake Assist (BAS) automatically kicks in to optimise braking power if emergency braking is detected. Other key safety features include COLLISION PREVENTION ASSIST PLUS, which not only detects hazardous driving situations but can actively intervene using autonomous braking. And ATTENTION ASSIST, which monitors steering behaviour and alerts you if you’re showing signs of fatigue.